There are weekends in life where everything just seems to come together and go your way. I’ve been enjoying one such weekend and am thrilled to share the events that have made these past few days so great. Check out that QR code! I signed up to run the Hermes Cleveland Chili Bowl 5K this year, figuring I could use a fun break in my Rite Aid Cleveland Marathon training. What better way to break up the monotonous miles than with a 5K in downtown Cleveland, followed by chili taste testing inside the Galleria? For a rather low $20 race fee, I was promised a t-shirt and free chili. A steal! The date of the race also coincided nicely with an event my in-laws had asked to take the kiddos to, so I knew I’d be free the night before the race and the day of, since the kids would spend the night. My brother-in-law Jon and a friend of his also decided to run, so we planned out packet pickup and carpooling in advance. As the weather report rolled out for the week, I anxiously checked Saturday’s forecast. Cold temperatures and snow were both possibilities, so I planned for multiple layers of clothes, my gloves and a headband to keep me warm. Ate my mandatory bowl of pasta and marinara Friday night and headed to bed early in the hopes of being well-rested. Race morning greeted us with some sun and mid-20 degree temperatures, but, thankfully, no snow. Our drive downtown was easy, parking easier and getting in to the Galleria a cinch. Bathroom lines were short and we planned our arrival for just enough time to do a quick lap around the building to warm up. I was happy with the size of the crowd-I didn’t feel alone, but I also didn’t feel like I was in a sea of thousands. Now, I’d be lying if I said I didn’t hope for a personal record (PR) every time I lined up at a starting line. I’m not fast, a middle of the pack-er at my very best, but something in me longs to improve my numbers and be better. My previous PR of 28:31 was earned in June, on a Sunday morning with 60 degree temperatures,sunny skies and a pancake-like course. I wasn’t burdened by thick socks, three layers of shirts or gloves. But, my February brain does not care for such details. It only hopes to go and to go fast. The Chili Bowl course wrapped us down and around the Cleveland Brown’s stadium, guaranteeing the climb back up the West 3rd street hill that I love to hate. As the race organizers rang the bell, I began with just a glimmer of a hope that I could beat my record. The course for this race highlighted some of the best of what Cleveland has to offer. Running down the West 3rd hill, you catch a glimpse of Brown’s stadium, the Great Lakes Science Center and the Rock and Roll Hall of Fame, all with the backdrop of Lake Erie, shining bright on this sunny day. As I ran past the first mile marker I was shocked to see I had hit the mile below nine minutes. I was also thrilled to look up and see one of my favorite employees from Achille’s Running Shop be one of the lead runners, having already made the turn and heading back towards the finish. I gave him a quick hurrah, cheered on the leaders and kept an eye out for Jon, who would be ahead of me by at least 5 minutes. As we hit the turn and wrapped back around the stadium, I knew the hill was coming up and my calves were angry from the work they’d done so far. I tried to run the whole thing, but stopped to walk for 30 seconds to catch my breath and give my muscles a break. After another minute of running, I stopped again, worried that my hopes of a PR were slipping away. I picked up speed as we hit the top of the hill, and as I checked my Garmin, I realized that my goal was still within reach, as long as I held my speed through the finish. I timed my play list well and the lyrics to The Scripts’ “Hall of Fame” pushed me through to the finish. I clicked my Garmin as I crossed the finish line and put my hands up in the air. 26 seconds shaved off my best time and a new PR for this girl! I located Jon easily and grabbed water and headed inside to relax. My stomach turned out to be a little too upset to handle chili, so I hung out and crowd-watched. I saw a couple of friends and got to meet fellow Rite Aid Marathon Blogger Christian, who was, as promised, wearing a bright orange jacket which made him easy to spot. When we got back to the car, I was able to scan the QR code on my bib with my Iphone and get my results immediately. 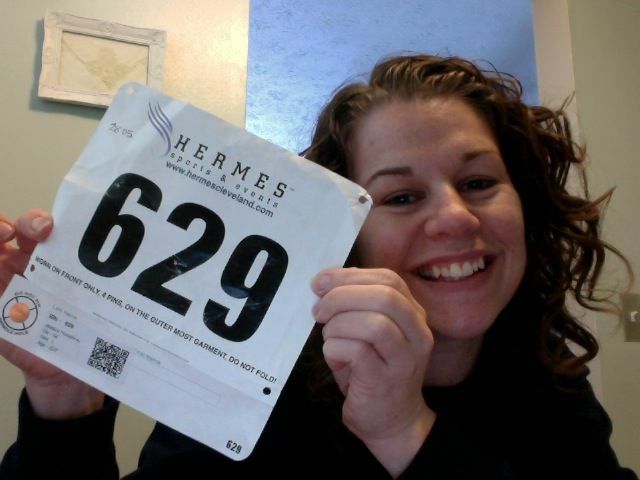 Kudos to Hermes for adding this awesome feature to their bibs this year! Loved getting the instant feedback and loved this race. Congrats to my carpoolers, Jon and Sarah, who also had great races as well! YAY!!!! Congrats on your PR. That is awesome! You’re right about that West 3rd Street hill–it’s a killer! I ran up that at the Run For Justice last October when the winds off Lake Erie were gusting especially hard. Probably the toughest stretch I’ve ever encountered during a race. The view on the way down is great but the only solace you can find on the way back up is the fact that the race is almost done once you get to the top! Thanks Joe! That hill is on my list-I’m going to conquer it one of these days! Congrats! It was a great race, not as crowded as the Turkey Trot but still enough runners to be exciting. I set a PR there too this weekend. Keep up the good work with your training! Congrats on running a PR, especially on such a hard course, That hill on W. 3rd is a tough one! Thank you for the encouragement! It was a blast!